In 1990, TPL helped the National Park Service acquire three acres to house the headquarters of the Lowell National Historical Park. The park's exhibits and guided tours tell the story of the city's transition from farm to factory, chronicle immigrant and labor history, and trace historical technology. 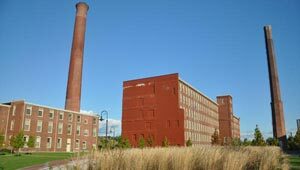 A walk through this landscape takes park visitors back in time as they explore the site's textile mills, worker housing, 5.6 miles of canals, and a 19th century commercial building. Legislation for the park's creation was sponsored by United States Senator Paul Tsongas, a Lowell native.